Fabrication shops are changing. Today, they rely on highly sophisticated processes and run state-of-the-art machinery that can deliver real-time analytics. Thanks to these modern approaches to manufacturing, operations are running at much higher levels of safety, cleanliness and technology. The stigmas of “dirty” and “dangerous” are disappearing. As fabrication facilities increasingly change the way they are set up and managed, changes to the machinery become increasingly necessary, too. Understanding customers is an essential part of offering them the products they truly need. In an era where people want it all, it’s only natural that fabricators, too, want the best of the best. They want products that are better, faster, stronger and smarter. And that’s why Mazak Optonics Corp. values customer input when it comes to producing its products, including a newly released Mazak PreviewG control that offers advanced hardware for excellent performance. Ticking all of its customers’ wish-list boxes, it is user-friendly, shows real-time cutting and maintenance data, and is integrated to work with manufacturing philosophies, such as Industry 4.0 and the Industrial Internet of Things (IIoT). 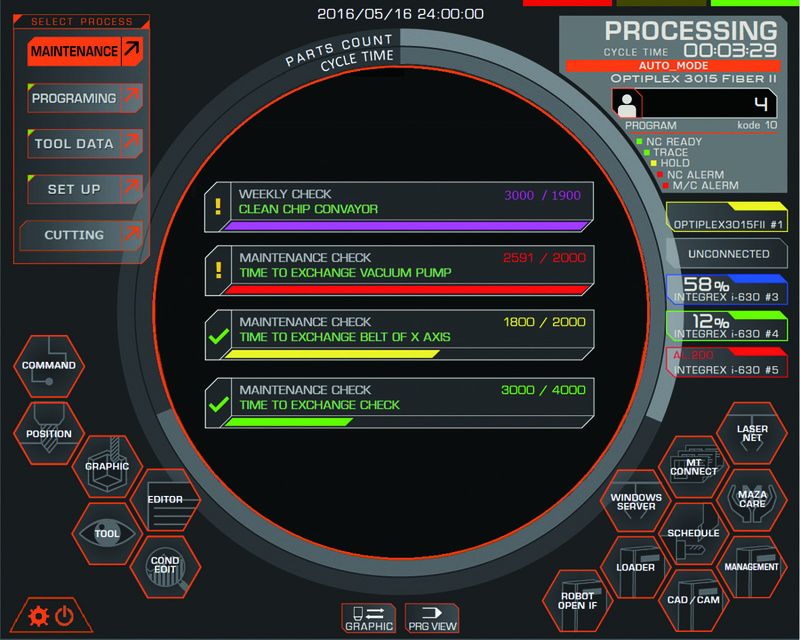 Mazak’s new PreviewG control is user-friendly, shows real-time cutting and maintenance data, and is integrated to work with manufacturing philosophies, such as Industry 4.0 and the IIoT. Being connected to the Internet has become increasingly popular with IIoT, the latest in analytics and smart technology coming to the manufacturing industry. 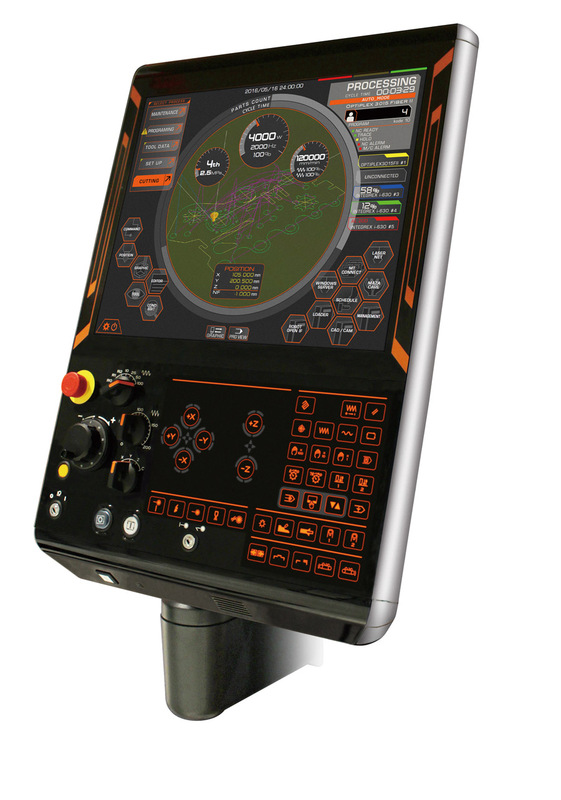 Keeping with that trend, the PreviewG control incorporates Smooth Monitor AX, a Mazak development that utilizes the MTConnect communication protocol. This combination allows for real-time, comprehensive monitoring that can be visually analyzed to realize higher productivity and efficiencies. There are four main components of Smooth Monitor AX, including the utilization dashboard, operation analysis, alarm analyzer and override history. The utilization dashboard shows machine monitoring that summarizes the current activity of each machine. With the PreviewG cutting screen, operators can see the cutting process as it moves from part to part through the entire nest. 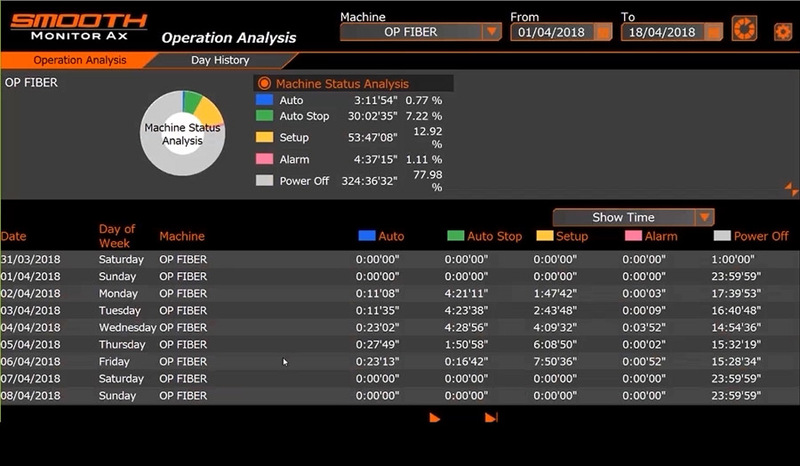 The operation analysis dashboard shows how much time is being spent on machine setup, actual running time and if there are any alarms or the machine is powered down. It also shows in which state the machine is spending most of its time. Similarly, the alarm analyzer dashboard includes which alarms have happened and the frequency at which they occur. Additional details in the dashboard show how many times in a day or in a week these alarms transpire. The maintenance screen shows timers for general preventative maintenance items. It also has a countdown for when maintenance items need to be performed. The final component of the dashboard is the override history, which in addition to showing rapid override, also displays a machine’s feed rate. Knowing where in the program the rapid override is being adjusted can start a conversation with the operator on why the machine was slowed down and what may need to be changed or adjusted to make the laser run quicker. 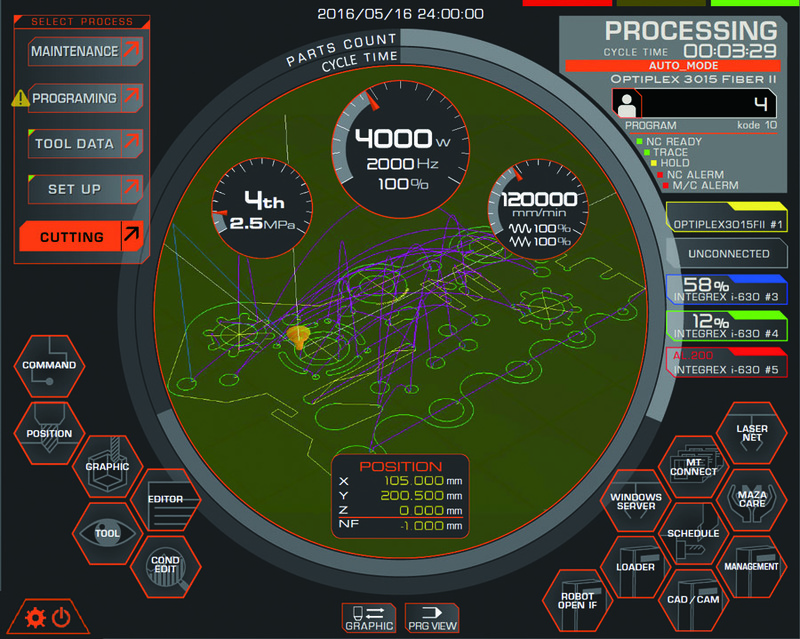 The PreviewG control, being IIoT connected, provides a real-time visual of the factory floor allowing for potential improvements to be addressed immediately to increase overall production and efficiency. Real-time monitoring helps determine real-time solutions – all of which can be done through Mazak’s iSmart Factory Solution. Having an easy-to-use, fast, smart and IIoT connected control is what customers want. And it’s what Mazak delivered with the PreviewG control. Its capabilities – tracking cutting and maintenance data, showing machine activity in real-time and beyond – make it a game changer for customers that leverage the latest in laser cutting technology. Machines such as Mazak’s OptiPlex Fiber III and the OptiPlex DDL are laser cutting systems with incredible capabilities. The increased speed and power through enhanced drive packages means that these sophisticated pieces of equipment need advanced controls that can compute all of that performance into high-quality parts. Unlike older controls, the PreviewG anticipates where the machine is going. By looking further ahead, it knows when corners are coming and sees the programmed path beyond those turns. If there is a deceleration coming, it can react automatically to increase the machine’s cutting performance. This responsiveness allows for higher quality parts because it can see the geometry and planning required ahead. One of the machine’s reactions to a deceleration is power ramping. With older controls, laser operators could only adjust the duty cycle of the power ramping. But the PreviewG control offers advanced performance through a more dynamic power ramping. This new style of dynamic power ramping still allows operators to adjust the duty in addition to power, frequency and feed rate. These control advancements help the overall performance of the laser cutting machine. And they’re made, in part, thanks to customer input. The setup screen offers a visual verification that the full system is engaged and ready to run, including the dust collector, resonator, locked door and conveyor. Unsurprisingly, it’s more effective to use up-to-date statistics as opposed to looking at weeks or months of old data. The PreviewG control shows cutting and also maintenance data in real time. Having this real-time awareness helps provide more control over the machine and overall production. While running a nest, if an issue occurs, the operator can quickly recut the part from the PreviewG control. Instead of going to the programmer, the operator can grab the CAD data, pick the part needed and create a new program. All that’s needed is to use the remnant from the previous sheet. This increased efficiency allows for more flexibility for the operator to create an additional part on the fly. The operator doesn’t need to be a CAD/CAM expert; the PreviewG control and software makes it is easy for anyone to do. Five new screens on the PreviewG control include maintenance, programming, tool data, setup and cutting information. The maintenance screen shows timers for general preventative maintenance items. It also has a countdown for when maintenance items need to be performed. For lifetime related items, such as nozzles and protective windows, the tool data screen is a constant monitor. It displays how many pierces the nozzle has performed as well as the time of the next cleaning for a protective window. Similarly, the setup screen is a useful aspect of the control, offering a visual verification that the full system is engaged and ready to run, including the dust collector, resonator, locked door and conveyor. To view the gas flow, feed rate, power and torch positioning, the cutting screen allows operators to watch the program run through a graphic rendering. Viewing from the 3-D graphic screen, operators can see the cutting process as it moves from part to part through the entire nest. 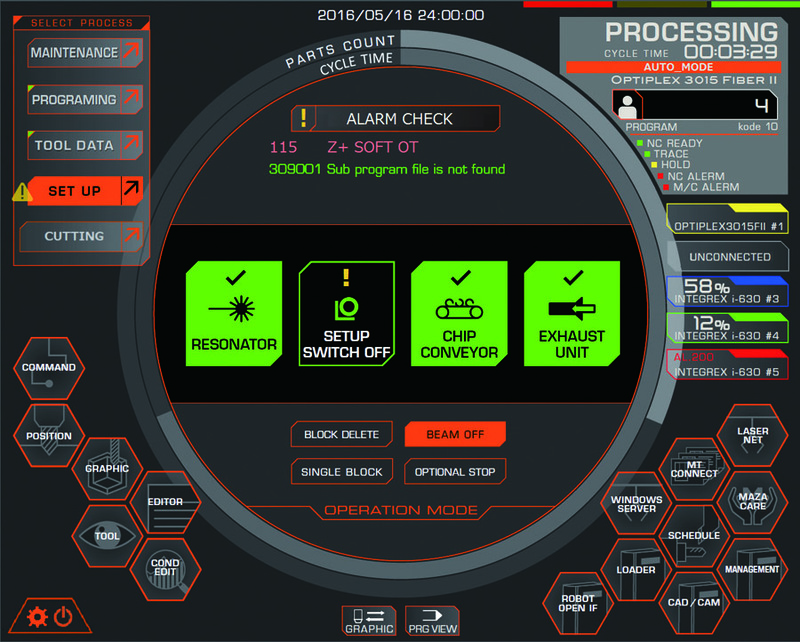 The PreviewG control incorporates Smooth Monitor AX, a Mazak development that allows for real-time, comprehensive monitoring that can be visually analyzed to realize higher productivity and efficiencies. Being able to perform is important, but that performance will come at a cost if the operator finds that a product is hard to use. Therefore, the PreviewG control was developed with many user-friendly aspects in mind. Those user-friendly aspects begin with access. The PreviewG control allows a laser manager to set up different levels of access for operators, ranging from machine use with no restrictions to limiting access to cut conditions, program editing, parameter adjustment and clearing the operational timer. The result is protection from unwanted editing and deletions, operator error and setup issues with the machine. The control also has various lists that allow operators to access more dynamic and flexible cutting databases, depending on a fabricator’s needs. Depending on the type of job, the dynamic database allows the operator to prioritize cut conditions. Additional features, such as the hand wheel and QR code reader, further boost the control’s ease of use. The remote hand wheel option moves the torch, making setups easier. By allowing the operator to see the cutting action from the side window, operators are given a better view during setups. In terms of the time it takes to set up a job, the QR code reader is a big help. Instead of having to search for the program associated with a sheet of metal, a QR code is scanned from a job sheet, which populates the nesting programs into the control.